1. 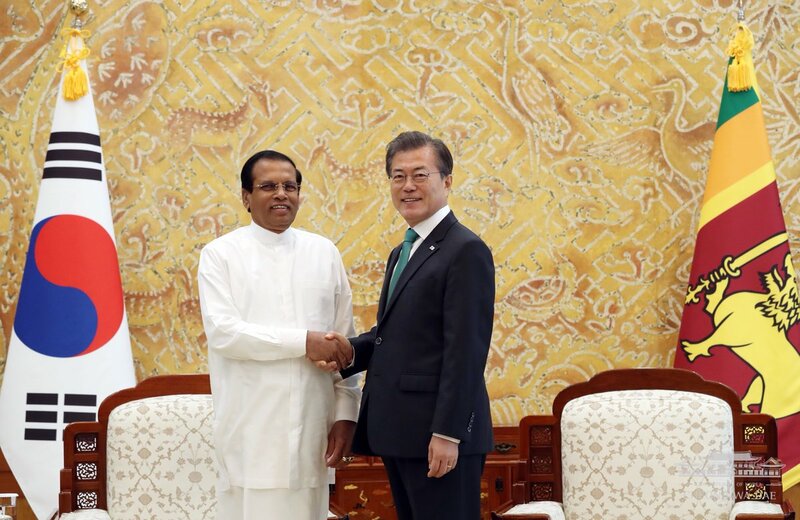 In commemoration of the 40th anniversary of the establishment of diplomatic relations, President Maithripala Sirisena of the Democratic Socialist Republic of Sri Lanka made a state visit to the Republic of Korea from November 28 to 30 on the invitation of President Moon Jae-in. In the summit meeting and the state dinner, held on November 29, the two Heads of State deepened their friendship and had discussions on ways to enhance the bilateral relations. 2. The two Heads of State, celebrating the 40th anniversary of diplomatic relations as an important milestone, expressed satisfaction with the continued development of friendly relations between the two countries. As partners with common values of democracy, and commitment to regional peace, security and stability, the two Heads of State agreed to increase exchanges of high-level government officials and parliaments of the two countries. They also reconfirmed their commitment to further strengthen cooperation in defense, including exchanges between the armed forces, strategic communication, increased training opportunities, and cooperation in regional dialogues. 3. To strengthen cooperation in the economic sphere for mutual benefit, the two Heads of State welcomed the signing of the Agreement on Economic Cooperation, which provides for the establishment of a joint commission to promote bilateral investment, trade and tourism. They also noted the importance of signing of an MOU between the Korea Trade-Investment Promotion Agency (KOTRA) and the Board of Investment of Sri Lanka, and agreed to further expand investment opportunities for Korean and Sri Lankan companies. They also welcomed the Business Summit in which President Sirisena and related companies’ representatives took part. 4. 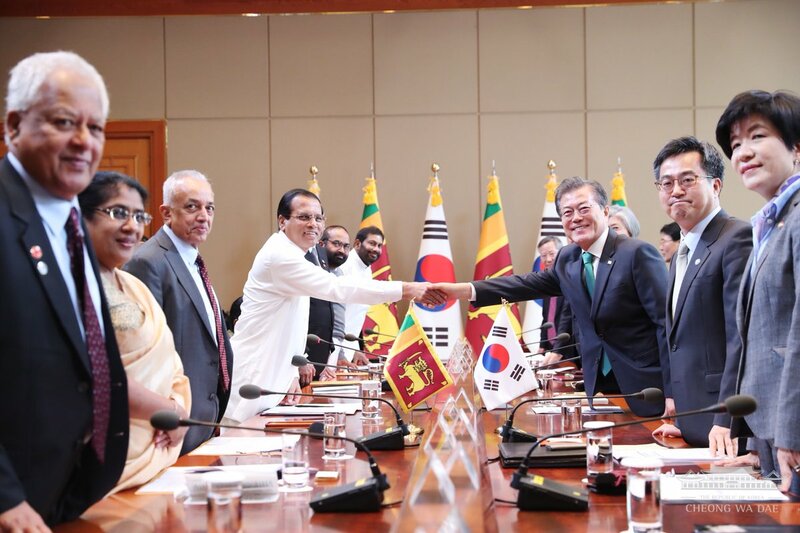 The two Heads of State welcomed the ongoing cooperation between the two countries under Sri Lanka’s Western Region Megapolis project, and were pleased to note the engagement of Korean companies in projects under the Megapolis plan. The two Heads of State agreed to actively seek ways to further enhance opportunities for Korean companies to engage in major infrastructure and development projects in Sri Lanka. 5. In the field of development cooperation, the two Heads of State welcomed the increase in Korea’s Economic Development Cooperation Fund (EDCF) for Sri Lanka from $300 million to $500 million for 2017-2019, and the signing of the EDCF Framework Arrangement. They agreed to continue development cooperation, including through the EDCF and KOICA, for Sri Lanka’s sustainable economic development. 6. 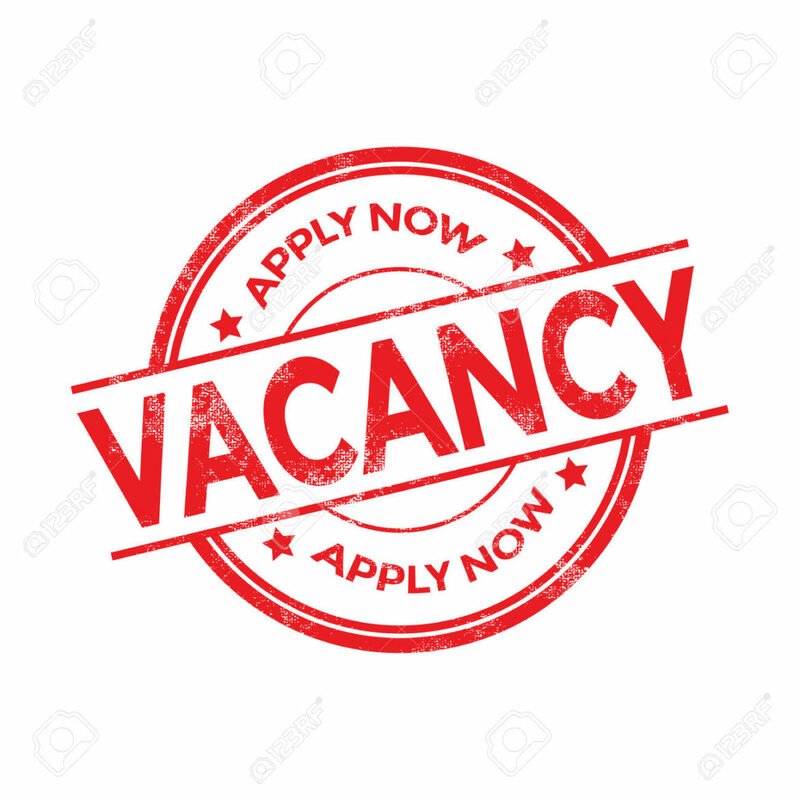 President Sirisena expressed his deep appreciation for the employment opportunities granted to Sri Lankan youth in Korea under the Employment Permit System (EPS). Acknowledging the contribution of Sri Lankan workers to the economies of the two countries, the two Heads of State agreed to further enhance cooperation under the EPS. 7. The two Heads of State, welcoming the recent increase in cooperation in ICT and medical sectors, agreed to expand cooperation in the fields of science, technology, innovation and ICT. They also agreed to expand mutually beneficial cooperation in the field of agriculture, noting the progress made under the Korea Program on International Agriculture (KOPIA) and the Asian Food and Agriculture Cooperation Initiative (AFACI). With respect to the fisheries sector, they agreed to make progress in Sri Lanka’s Multipurpose Harbor project, based on the MOU signed by the two countries in 2016. 8. Acknowledging the bilateral cultural ties throughout history and in recent times, the two Heads of State welcomed the continued increase in people-to-people exchanges between the two countries. They agreed to further promote such connectivity through cultural and tourism exchanges and the revision of the bilateral Air Services Agreement. Both leaders also welcomed the signing of the new Agreement on Culture, Arts, Education, Youth and Sports. They expressed satisfaction with the many cultural events held in the two countries in 2017 to mark the 40th anniversary, including the issuance of commemorative stamps by both countries. 9. The two Heads of State noted the contribution to Sri Lanka’s nursing education through the Korean government’s Leading University Project for International Cooperation. They also discussed ways to further strengthen cooperation under the Global Korea Scholarship program and promote Korean language education in Sri Lanka. 10. The two Heads of State strongly condemned the DPRK’s test of a long-range ballistic missile, violating relevant United Nations Security Council resolutions. President Moon expressed his appreciation for Sri Lanka’s strong condemnation of the DPRK’s continued nuclear and missile tests and its faithful implementation of sanctions under relevant UN Security Council resolutions. The two Heads of State reaffirmed their support for the peaceful resolution of the North Korean nuclear issue in a complete, verifiable and irreversible manner and urged North Korea to comply with its obligations under relevant United Nations Security Council resolution. The two Heads of State agreed on active cooperation for the implementation of UN Security Council resolutions and underscored the importance of resuming a meaningful dialogue for the peaceful resolution of the North Korean nuclear issue. President Sirisena expressed his firm support for the efforts of the Republic of Korea to improve inter-Korean relations and establish permanent peace on the Korean Peninsula, including the initiative of the Republic of Korea proposed in Berlin on 6 July 2017. 11. The two Heads of State shared the view that the upcoming Pyeongchang Winter Olympic Games could serve as a useful occasion to promote peace and stability on the Korean Peninsula. 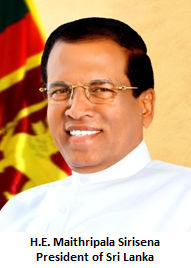 Expressing his wholehearted support to the Korean government’s efforts towards a peaceful Olympics, President Sirisena reiterated the Sri Lankan government’s willingness to offer active cooperation and congratulated President Moon on the excellent preparations for a successful Olympics. 12. The two Heads of State exchanged views on regional affairs including Southwest Asia. President Moon outlined the New Southern Policy for building pillars of prosperity and ‘People First’ relations with South Asia and ASEAN countries. The two Heads of State agreed to deepen multilateral cooperation on global issues such as elections in international organizations, climate change and sustainable development. 13. President Moon lauded the progress made by the Government of Sri Lanka under the leadership of President Sirisena in national reconstruction and reconciliation and promotion of human rights. He further expressed the hope that Sri Lanka will achieve reconciliation and prosperity, and will continue to engage the international community in this endeavor. 14. The two Heads of State acknowledged the importance of continued follow-up implementation of the results of their summit through regular policy consultations between the two countries. 15. President Sirisena extended an invitation to President Moon to visit Sri Lanka at a mutually convenient time, which President Moon gladly accepted.